This is a picture of the creek that runs through my very suburban neighborhood. It's beautiful in the springtime - I took this picture about a month ago but as the spring rains stop and summer advances and the temperature rises the water slowly starts to disappear. I walk our beagle Charlie around this creek every day; I love to see the families of ducks. He's so used to them now he doesn't even bark. We are moving back to the city in a couple of weeks and I'm looking forward to living across from a world class art museum and near great shops and restaurants but I will surely miss our quiet morning walks. It's not exactly "A River Runs Through It" and you can't fish in it but there is a magic for me in living near the soothing sounds of the water. 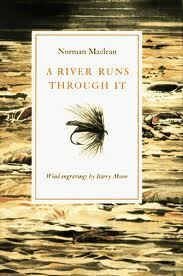 In the meantime, "A River Runs Through It" is a book and movie pairing I highly recommend. Because really, can you ever get enough of Brad Pitt?? I'm posting this picture as part of Alyce's Saturday Snapshot meme. If you want to participate visit AtHomeWithBooks.net. It's fun to see what photos other bloggers have taken when they're not busy reading or blogging! Yes, it's nice to live somewhere where nature is close. I'm lucky enough to be close to a city, but far enough from it too enjoy birdsong and trails just behind the house. I will miss being close to nature ... but in my case being an hour away from what the city has to offer is too far! What a nice creeek! Yes, I think that walking along the edge of it, listening to the water would be quite relaxing. Yes, I find my stress evaporating! I will have to find a 'citified solution. Ohh yes! I loved the movie and i do love the sound of rushing water. How wonderful that you live so close to a stream. But we are moving soon! Still, my consolation is that it is not much of a stream during the blazing summer months here. 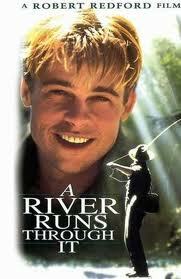 Definitely one of Brad Pitt's best films, and a love picture of your local river! Not exactly a river but still .... I really enjoy your British snapshots! That's beautiful. I've always wanted to live near a creek, ever since Anne of Green Gables went into raptures when she realized Green Gables had a creek! I'd forgotten that! It's funny; people suggest I bring an i-Pod but I find I'm completely engrossed by the sounds of the water, the birds, the rabbits and lizards moving scurrying through the crunchy leaves, the ducks quacking. I'm really not a nature girl but somehow this soundtrack never gets old. I completely understand missing the perks of the country while in the city and vice versa. I grew up in the country and our house was next to the point where two creeks came together and it was lovely. I will have to be content with the intersection of Third and Fairfax - that's L.A.'s Farmer's Market, right around the corner from our new place! A creek in the country side and a dog to walk around it. What bliss. But I agree with you - I also like the idea of the museum and a big city. I'm looking forward to getting a museum membership to LACMA (L.A. County Museum of Art) and taking advantage of all their special events, openings and screenings. I'm trying to figure out what part of California this is in...I'm sure it must be Northern. Love creeks and wooded areas. Thanks for sharing...and I love how you connected it to the book and movie. Glad you could visit my Saturday Snapshot. Nope! Southern California. About 45 minutes to an hour and a half (depending on traffic) northwest of Los Angeles. We currently live in Oak Park (the home of the missing Fox executive) which is ten minutes down the road from Calabasas where the Khartrashians live! Cool about the art museum...but, I get it about missing your walks... I have never read this book. I'm going to look for it at the library. Libby, you will appreciate this! One of the things I'm excited about is that the director Jason Reitman, does this thing called Live Reads at the museum. Once a month, from Sept thru May, he takes a film script and assembles a cast of actors to read it in front of an audience in the musuem's theatre. Last month he did The Big Lebowski. Seth Rogan played the Dude, Christina Hendricks played Maude, Hank Azaria took on a slew of parts, etc. My son was there and met Ivan Reitman and just found the event thrilling and inspiring. A lovely little stream...and you're right, much quieter than walking in town. And I like yours too. Thanks for visiting, Bev. Very nice -- I love feeling close to nature. Nothing quite beats the sound of the sea that you are so blessed to have, does it? Yes! You must. Thanks for stopping by! I haven't read the book or the movie either. I do have a pretty little stream within walking distance of my house. I would miss the sights and sounds of nature if I had to live in the city. Yes, I'm sure I will miss them. But I will be close to Hollywood so plenty of "wildlife" LOL! Nice spot of nature to walk the dog by. I loved the movie and I'm not sure if I read the book. He's going to have to turn into a well-behaved city dog. Hoping he will like the park nearby - it is fairly large and looks interesting but we haven't walked it yet. What a lovely little creek. I love the gentle sound of water running. I loved the movie, but have never read the book ... I didn't know there was a book. I may have to check it out some day. I love the discovery of book and movie pairings. I just watched that wonderful old movie Three Coins in a Fountain the other day (On Netflix instant streaming) and saw it was based on a book. I may just have to check that one out! I would love to have a stream like that so close by! What a nice little creek -- it looks like a peaceful place to sit and read a book! As the water trickles around. I'm all for the outdoors like this, but I also love the city. And I live VERY close to a world class art museum -- a Van Gogh exhibit is the next thing on deck there and I definitely plan to go see his Irises. All the best to you in your move!